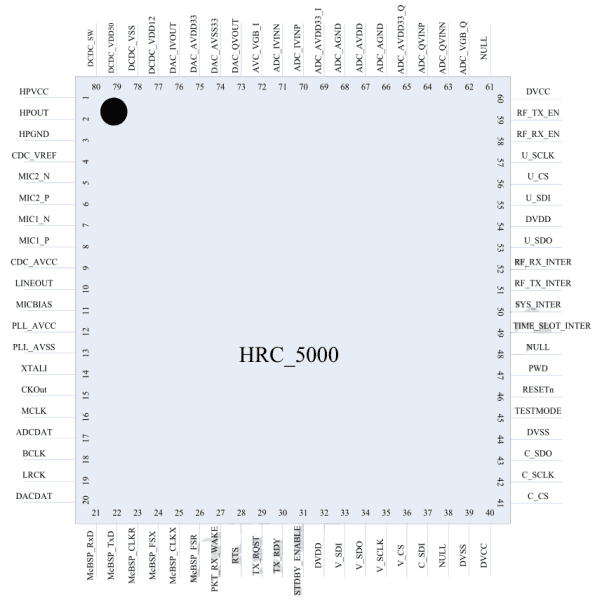 This document is based on a datasheet for the HR_C5000 written in Chinese. Fragments were copied and pasted into Google Translate, and the english translation was copied from here. When finished and double-checked, fragments from this file may eventually find their way to the MD380 Tool's C5000 baseband chip documentation. The original datsheet was downloaded from github.com/pchickey/md380-re/tree/master/datasheets. This document, along with all embedded images, can be downloaded from www.qsl.net/dl4yhf/RT3/HR_C5000_english.zip. Blocks marked like this were added later, with comments and references to the MD380 tools. HR_C5000 is Hong Rui independent research and development in line with ETSI TS102 361 (DMR) standard digital intercom dedicated chip. Chip using 4FSK modulation and demodulation technology, 12.5K channel using 2-slot TDMA communication mechanism to achieve 2 Way digital voice and data communication transmission, support full-duplex, half-duplex communication. Chip design uses the physical layer, data link layer and call control layer layered design, independent open user interface, fully open Put the state information and configure the interface, user-depth development of the second to support the agreement parameter configuration, suitable for digital intercom Handsets, private cluster terminals and low-speed data, voice transmission terminal applications, support for trunk and end-to-end use. 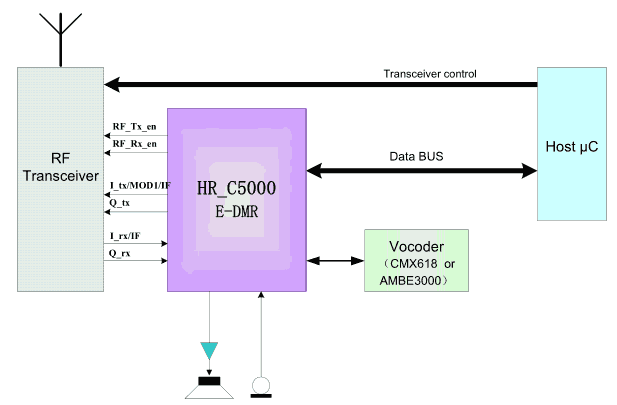 Chip using C-Bus and McBSP interface seamless docking CMX638, AMBE3000 other vocoder chip, while mentioning For standard SPI interface, flexible selection of vocoder, support for encrypted voice, data interface, while digital voice recording, playback And a tone input providing interface. Built-in CodeC, Mic input and Line output, providing Mic gain control and LineOut volume control, there are Effectively reduces user peripherals and configures standard I 2 S interfaces for external CodeC. Chip built-in high-performance dual-channel AD / DA unit to support baseband IQ, can be configured IF IQ, can be configured IF and two Point modulation and other RF interfaces to provide independent IQ bias voltage adjustable design, IQ Road, you can set the cepstrum. 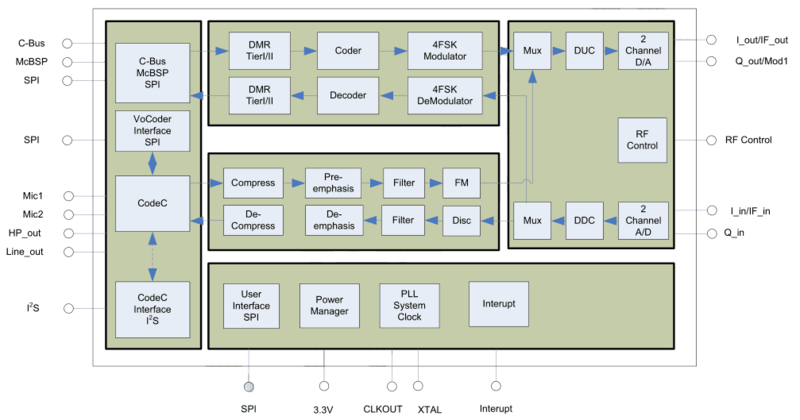 Using standard analog walkie-talkie processing unit to support 12.5KHz / 25KHz channel communication. 3.3V power supply chip, built-in power management module, to achieve low-power design. The product is available in 80-pin LQFP or VQFN packages. Indeed, there's even a REGISTER for the microphone gain - see table 2. The complete list of pins is readable in the original chinese PDF. Note the discrepancies between pin numbers in the datasheet (by HR) and the MD380 schematics ! AI = analog in, AO = analog out, DI = digital in, DO = digital out. HR_C5000 chip design in line with ETSI 102 361 (DMR) standards, to achieve Tier I, Tier II communication protocol, Digital voice and data communications, can be applied to digital intercom, a small central command and control system applications, dedicated cluster end End and data communication node applications. Chip design using three separate design, the user can flexibly apply the physical layer, data link layer and call control layer, real Now different application requirements. integrated high-performance voice CodeC, application solutions directly to the Mic signal input, analog voice output. Chip built-in a variety of voice code interface, and CMX638, AMBE3000 achieve seamless connectivity, the chip parameters can be straight. fully open the relevant parameters of the standard.
" 0x0F W/R ADLinVol 0xB8 Bits 7..3 11111: 12 dB illegal ? No modulation at all ! 11110: 10.5 dB also no modulation at all ! and the voice signal, depending on reg 0x0E. 0x13 ? ? ? ? don't exist ?
" 0x14 W/R LocalSrcAddrL 0x01 .. ..
" 0x15 W/R LocalSrcAddrM 0x00 .. ..
" 0x16 W/R LocalSrcAddrH 0x00 .. ..
" 0x17 W/R LocalGroupAddrL 0x01 .. ..
" 0x18 W/R LocalGroupAddrM 0x00 .. ..
" 0x19 W/R LocalGroupAddrH 0x00 .. ..
" 0x1A W/R LocalBSAddrL 0x01 .. ..
" 0x1B W/R LocalBSAddrM 0x00 .. ..
" 0x1C W/R LocalBSAddrH 0x00 .. ..
" 0x1F W/R LocalEMB 0x10 .. ..
" 0x20 W/R LocalAccessPolicy 0xAA .. ..
" 0x21 W/R LocalAccessPolicy1 0xA0 .. ..
Codec 0x30 W/R BCLK_CNT_H 0x00 Bits 7..0 Mclk / BCLK division ratio, upper 8 bit. CCL 0x60 W/R TransControl .. .. ..
" 0x61 W LocalDestAddrL .. .. ..
" 0x62 W LocalDestAddrM .. .. ..
" 0x63 W LocalDestAddrH .. .. ..
" 0x64 W/R LocalVoiceOACSU,... .. .. ..
" 0x65 W/R SPEn,... .. .. ..
CCL / LC 0x66 W/R LocalLCPF,... .. .. ..
... ... .. .. .. .. ..
" 0x90 R RecvDataCRC Bit 7 Data fragment CRC test result. 0 = correct, 1 = CRC error. CodecIP whether to enter Power Down mode, active high. CodecIP whether to enter the low power consumption mode. Most of the register descriptions are quite readable in the chinese PDF. The protocol to access these registers is in chapter 8, "Data read and write". A few register values (read from an RT3 via USB) are in md380_fw.html. Register 0x0F ("ADLinVol" + "MicVol") didn't exactly behave as listed in the orignal datasheet. With the test setup described here, the microphone sensitivity could indeed be controlled in 1.5 dB steps, but the max 'working' value in reg 0x0F bits 7..3 was 0b11101, not 0b11111 or 0b11110. The value written by the MD380 firmware was 0b11001. A (SYNC), B (LC), C (LC), D (LC), E (LC), F (Null). Determines the type of the received frame, and performs deinterleaving, decoding, and de-interleaving corresponding to the transmission according to the received frame type. Supports voice super frame framing, LC Header, PI Header or PI Header mode. Support data 9.6kbps framing, add data LC Header, data and LC Terminator. First configure the base parameters; see Table 3 DLL. if there is synchronization information, will produce a synchronization signal trans_slot_c. determine whether it can send. (not sent depending on the configuration of the Polite State transition under policy conditions). Interrupt, to the CPU to provide 30ms interrupt. thus providing CPU 30ms (Approximate) interrupt. 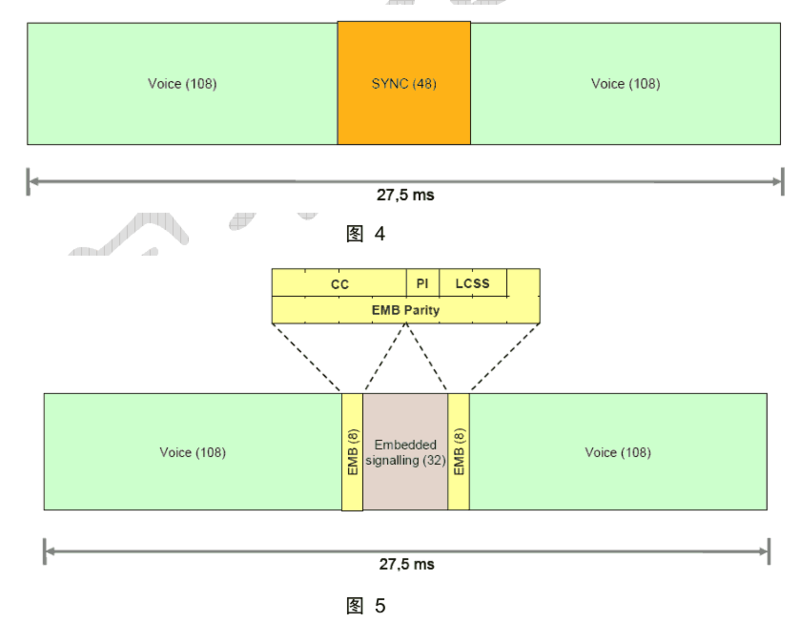 BPTC, interleaved and framed in the next time slot to send, chip open voice coding, you can control the CPU to open voice coding. Receiving, on the other hand, gives the DataType, CC, PI, and 72bit LC data (or CRC check error) in the receive interrupt error). BPTC, interleaved and framed in the next slot. DataType, CC, PI and 80bit data (or CRC parity errors) are given in the receive interrupt. and the framing is transmitted in the next time slot. After receiving the LC information from the superframe, CC, PI, and LC are provided to the CPU, and the voice data can be transmitted through the RAM Sent to the CPU, you can also directly into the decoder's RAM in the received A frame, automatic (or CPU control) is turned on Speech decoding. the chip done CRC, BPTC, interleaved and framed in the next slot to send. DataType, CC, PI and 72bit LC data (or CRC parity error) are given in the receive interrupt and are disabled Speech decoding (can be controlled by CPU off). DLL state mechanism in the loss of lock state, it will turn off speech decoding (CPU control can be closed), the chip Out of lock exception (interrupt). CPU 0x50 set to send type 0x30, write 80bit data, write to send enable, the chip done CRC, BPTC, Interleaved and framed in the next slot to send. DataType, CC, PI and 80bit data (or CRC parity errors) are given in the receive interrupt. CPU 0x50 set to send type 0x40, write 80bit data, write to send enable, the chip done CRC, BPTC, Interleaved and framed in the next slot to send. DataType, CC, PI and 80bit data (or CRC parity errors) are given in the receive interrupt. CPU 0x50 set to send type 0x50, write 96bit data, write to send enable, the chip done BPTC, Interleaved and framed in the next slot to send. DataType, CC, PI and 96bit data are given in the receive interrupt. CPU 0x50 set to send type 0x60, write 80bit data, write to send enable, the chip done CRC, BPTC, Interleaved and framed in the next slot to send. Data Block (96/144 / 192bit requires packet data block SN, 9bit CRC and Fragment CRC): CPU in 0x50 set send type 0x70 / 0x80 / 0xA0, write 96/144/196bit data, write to send to enable, Chip done BPTC / Viterbi / no, interleaved and framed in the next time slot to send. DataType, CC, PI and 96bit data are given in the receive interrupt. CPU 0x50 set to send the type 0xB0 ~ 0xF0, write 96bit data, write to send enable, the chip done BPTC, Interleaved and framed in the next slot to send. DataType, CC, PI and 96bit data are given in the receive interrupt. Note: If the SlotType field is not validated, it will be listed as invalid data, lost, but the chip will tell Layer is missing. This process is automatically processed when the MS initiates a relay call. Feature Not Supported signaling, using Response CSBK, set the corresponding value for feedback. Support the use of LC to determine the way FID and FLCO framing, CCL design time slot in line with the standard Of the group call state flow, matching time slot PTT event, the channel to apply for transmission rejection, channel transmission acceptance, voice access Delayed Access Voice Receiving, PTT Release, Voice End LC Transmission, Received Idle Voice End, Non-Active Receive voice exit termination and no signal reception termination. Supports Rate 1/2, Rate 3/4, and Rate1 acknowledgment messages. It also supports user-defined numbers. The time parameter can be set by Polite strategy stipulated in the protocol. CCL mode base configuration includes hardware configuration and parameter configuration. Group call design group frame includes Voice LC Header, Voice A ~ F, LC Terminator. The user must configure the content: FLCO, Service Option, Group address, Source address. Slot: PI LC: PF, Mask: Voice LC Header, Terminator with LC Access Polite policy. FM system compatibility refers to the application for analog walkie-talkie, support voice band signal processing, including compression, decompression, Pre-emphasis and de-emphasis application technology, in full compliance with TIA / EIA-603 standard. Figure 9 Customize FM via register 0x34, to switch filter, pre-emphasis / de-emphasis, compression / decompression features. The internal clock of the system is 49.152MHz, 9.8304MHz is provided for the DMR digital part, the FM part provides 8.192MHz, CodeC part provides 12.288MHz, while providing the external CodeC possible 24.576MHz. where NO = 2 PLLDO. Note the discrepancy in the original (chinese) datasheet. Registers 0x18 and 0x19 are listed as 'LocalGroupAddressM' and 'LocalGroupAddressH' in chapter 2. CLK := XTAL * PLLM / (PLLN+1) / (2*PLLDO) =: 4.9152e+07 = 49.152 MHz, q.e.d. In normal mode, if the RF module does not need to send and receive switching configuration, then only one system interrupt on the (? .. CPU needs to be serviced ? - WB). (? Between interrupts.. - WB), You can carry out normal work processing. 30ms interrupts are active in the physical layer mode and data link layer mode. The CPU uses this interrupt to decide(?) whether a time slot is transmitted, and (fills in?) the content to be transmitted. The DMR specification ETSI TS 102 361-3, page 8, sheds some light on this. They use the term 'frame' (60 ms) for two contiguous time slots. What ETSI calls 'frame' may be the 'superframe' in this datasheet. This interrupt has no sub-status register, indicating that the transmit request was rejected because the channel was busy. Start with the sub-state register 0x84, 0x85 can be masked by the corresponding interrupt Sub-shape(?). The Vocoder configuration returns an interrupt when the AMBE3000 is configured to use the CPU. Send the end of a sub-state register 0x86, the corresponding interrupt can be masked by 0x87 Sub-shape(?). After the access interrupt has no sub-status register, after receiving the interrupt, indicating that the access voice communication is 'After the access mode'. The receive data interrupt has no sub-status register, but its receive data is received by register 0x51, using the DLLRecvDataType, DLLRecvCRC description of the received data type and the Wrong circumstances, CPU accordingly corresponding status display, you can also shield (? acknowledge or disable ?) the corresponding interrupt. The receive information interrupt has the sub-state register 0x90, the sub-status register has only one type, 0 indicates the whole One message reception check is passed, and 1 indicates the entire message reception check error. Abnormal Exit Interrupts There are no sub-state registers, and the cause of the exception is an unintended internal state machine Interruption. Physical Layer Separate Operation Reception Interrupts: There are no sub-state registers that are generated at the physical layer in a separate operating mode. The received data generated after the interrupt, notify the CPU to read the appropriate register to receive data. Figure 12 : System Interrupt Handler. Branch by the bits read from register 0x82 ? 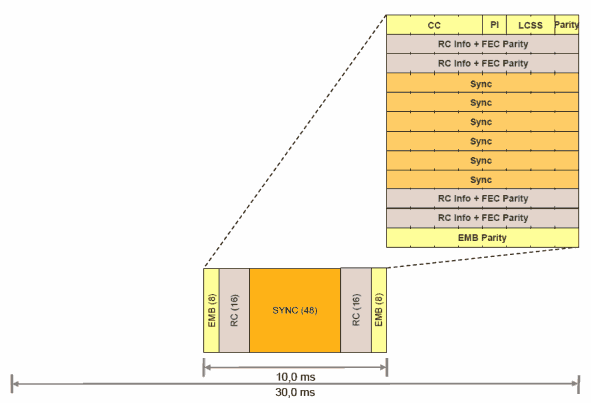 This chapter describes how to read and write registers inside the C5000 chip. There are two SPI interfaces (SPI0 and SPI1) from the HR_C5000's point of view. In the MD380-Tools, single registers can be read via c5000peek() and written via c5000poke() in md380tool.py . Their counterparts in the MD380 firmware are c5000_spi0_readreg() and c5000_spi0_writereg() . Correction 2017-06: The MD380 circuit diagram seems to be incorrect. The 'user SPI' clock input isn't PE3 but PC13, the input data (from STM32 to C5000) is PE3, not PE4. SPI0 and SPI1 chip is equipped with two interfaces for data read and write. According to read and write, subsidiary parameter configuration, CMX638 parameter configuration, AMBE3000 parameter configuration, tone data writing. It is used to read and write voice data of general vocoder. Cmd is used to identify read and write and distinguish between different functions and select Ram space. Addr is the initial address to be read and written at a later time, and data to be entered (or read) at a later time will start at the initial address, and Accumulated in each case, in each CS effective case, will continue to accumulate. (in other words: The same 'address auto-increment' feature that many chips with I2C or SPI interface use. Data0-Data'N' is the data for each read and write, the maximum length of 2048 Byte. State control Ram as shown in the parameter configuration table, the address space is 0x00 ~ 0xFF, which includes the hardware parameter configuration, State control parameter configuration and interrupt information read. Auxiliary parameter configuration table is a number of very common parameters classified as ancillary parameters, including the agreement of some constant settings and Timing parameter settings, the address space is 0x00 ~ 0xFF. The information data length is 9 bytes (LC), 10 bytes (CSBK, Header), 12 bytes (custom, Rate1 / 2), 19byte (Rate3 / 4) and 25byte (Rate1). The address space for the distribution of 0 ~ 47; three working mode, the number of information according to the length of 9byte (LC), 10byte (CSBK, Header), the address space of 0 to 15, taking into account the use of double-headed Information, the maximum length of 12 bytes (PI), the address space of 16 to 27, three layers of short message data storage space Between 48 ~ 2047. ToDo: This needs to be refactored / reformatted ! Before configuring, wait for the initialization of the AMBE3000 after the HR_C5000 is powered on. Turn off the power-down mode by turning off parity on the end of the control packet. wait for the corresponding interrupt, then you can read back the data packet. the interrupt is not generated. you can get harmony code (??) Consistent interfaces and data. Read and write voice data operations cmd = 0x03 / 0x83, addr = 0x00. Configuration parameters are handled via SPI0. MUX0 is controlled by [0x06] [7: 6]. ie CMX638 and AMBE3000 cannot be open at the same time. MUX1 is controlled by [0x06] . when = 1, SPI1_In → MUX1 → SendRam0. MUX2 is controlled by [0x06] . when = 1, SendRam0 → MUX2 → RecvRam1, said custom sound. MUX3 is controlled by [0x06] . when = 1, SendRam1 → MUX3 → SPI1_Out, that's vocoder recording. where [0x06]  has the highest priority, followed by [0x10] . 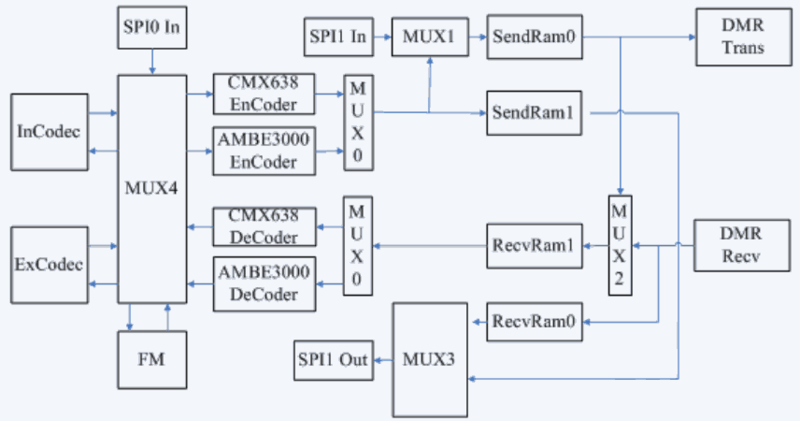 SPI2 → MUX4 → InCodec / ExCodec. Codec → MUX4 → Vocoder and Vocoder → MUX4 → Codec. Chip support AMBE3000 and CMX638, built-in vocoder and external optional, voice input from the Mic, through the Codec. And then output to the vocoder through the SPI2 interface. The compressed data of the vocoder is transmitted through the multiplexed data line (McBSP / C-Bus). vocoder will decompress the data through SPI2 to CodeC, CodeC after DA output to the Speaker. DTMF- and other signalling tones ('2T/5T/DTMF_OUT', low-pass filtered from PC8='BEEP') → HR_C5000 pin 5 'MIC2_P' . Despite this 'In-CodeC' configuration, the I2S (digital audio) interface is also connected to the CPU (STM32F405) ! See also (external link) : Audio signal paths in the RT3 / MD380 and the 'baseband' chip . External CodeC I2S read and write clock rates can be configured via (registers? - WB) 0x30, 0x31, 0x32, 0x33. 49.152MHz/(4*0x0017) = 534261 Hz (BCLK='bit- or bus-clock') ? 49.152MHz/(4*0x02FF) = 16020.9 Hz (LRCK='word clock') ? Not sure if 'LRCK' is the actual sampling rate, or two times f_sample. Obviously 'Mclk' isn't the signal on pin 'MCLK', but the PLL'ed frequency from pin 14, 'XTAL'. In the MD380, this pin (14) is fed with 29.4912 MHz from X201. As explained in Chapter 6, 'System Clock', the C5000's PLL is programmed by the MD380 firmware to convert this frequency into 49.152 MHz.